Sometimes I get the craving and nothing else will do. The craving for a sandwich. 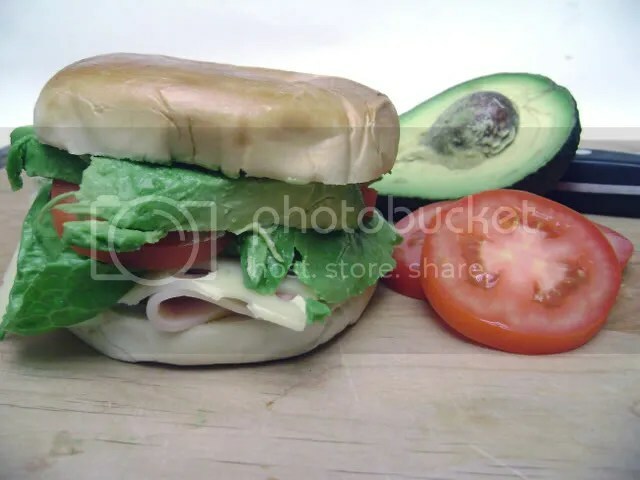 Turkey, ham, swiss and avocado on a bagel. With a little squirt of mayo and mustard. I call it a bagelwich. You are so drooling over that big hunk of avocado right now. Don’t lie. TWD #55: When life hands you lemons…	I kid you not. I have a hunk of avocado exactly like that in my fridge right now… I’m pretty sure it’s not going to be there for very much longer. Oh, I am TOTALLY drooling over that! Bagelwich… here I come! I get cravings when I cruise the crimson wave. The sand looks fabulous, too me this is pure comfort food but in Japan I am SO not paying 10$ for six slices of cheese.